CLEARFIELD – Instead of going to trial Monday morning, a Bellefonte man pleaded guilty to burglarizing a local business’ garage, setting a stolen truck on fire and robbing a senior citizen during a crime spree last February. 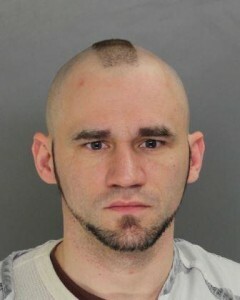 Christopher James Handte, 26, of Bellefonte had been charged with aggravated assault, robbery, burglary, reckless burning or exploding, criminal mischief, theft by unlawful taking, receiving stolen property, unlawful restraint, false imprisonment, simple assault, recklessly endangering another person, access device issued to another who didn’t authorize use, harassment, kidnapping to facilitate a felony and dangerous burning. Handte agreed to a minimum sentence of 15 years in prison, and his maximum sentence will be up to the judge. Handte, who is already in state prison, will be sentenced in this case within 60 days, said Clearfield County District Attorney William A. Shaw Jr. According to the criminal complaint, on Feb. 20, 2015, Trooper Matthew Gray of the Pennsylvania State Police, Clearfield barracks, was dispatched to the parking lot of a Morrisdale church for a report about a truck being on fire. State police determined that the truck was owned by a local business. An employee of the business told Gray that the truck was equipped with a GPS tracking device. Upon investigation state police determined that someone had gained access to the garage of the local business and stolen the truck. Upon review of the travel report generated by the tracking device, Gray was able to determine when the truck was stolen and where it was driven to. According to the travel report, the truck had stopped in the area of local businesses, such as J.J. Powell and the Harbor Inn near Sheetz in Philipsburg, and Snappy’s Convenience Store, Houtzdale, late at night Feb. 19, 2015 and into the early hours of Feb. 20, 2015. Surveillance video was recovered from the local businesses. Additionally, various items that were stolen from the garage of the local business were located along Deer Creek Road, where the truck was eventually parked at. On Feb. 21, 2015, Mostyn was assigned to investigate a robbery at a local residence. According to the criminal complaint, the victim received a knock at her door from an unknown male on the evening of Feb. 20, 2015. The male was in need of gas, and the victim invited him into her residence. The victim also allowed the male to use her bathroom and phone while she made him a cup of tea. The male asked for duct tape for his boots. However, he used it to tape the victim’s hands behind her back. When the victim was able to free her hands, it angered the male. He then taped the victim to the kitchen sink and struck her twice in the face. According to the criminal complaint, after asking the victim if she had any ATM cards, the male left her residence, taking her vehicle, purse and the glass and tea cup he drank from. After the male fled from the scene, the victim remained taped to the kitchen sink. She remained taped up until the following day when she was discovered there. The victim was then transported to UPMC Altoona for treatment of her injuries and hypothermia. On Feb. 23, 2015, the victim’s vehicle was located and within it was a ceramic mug. The mug was tested for DNA. Later that same day, troopers located a makeshift camp in the woods, according to the criminal complaint. Upon investigation state police determined that many of the items at the camp belonged to another victim. This victim was interviewed and stated that the items found had been stolen from his garage several days earlier. These items, which included a towel, were also sent to the lab for DNA testing. Lab analysis indicated Handte’s DNA profile matched that from the towel. During interviews with state police, Handte initially denied stealing the truck from the local garage and taping up and then robbing the victim. When advised he’d been observed on video surveillance at local businesses, which was confirmed by the truck’s tracking device, he admitted to the crimes. When asked if he set the truck on fire in the Morrisdale area, Handte told state police he didn’t remember details due to using a lot of heroin. He told state police he spent the night in the woods and used stolen items to make a camp site. He again told state police that he’d used a lot of heroin and wasn’t able to remember details. When state police asked about other specific details related to the crimes, Handte didn’t remember stopping and throwing items into the river along Deer Creek Road. He told state police that he was involved with a gang, and was asked to steal some all-terrain vehicles. Handte also told state police he owed gang members money for drugs.